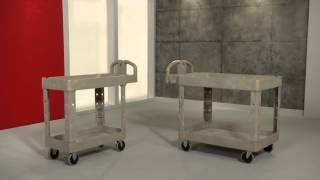 Multiple-duty service cart for use in warehouses, mail rooms, conference rooms and maintenance facilities. Heavy-duty plastic won’t rust, dent, chip or peel. Lightweight for easy maneuverability and quiet operation. Rounded corners mean no sharp edges to nick walls or furniture. 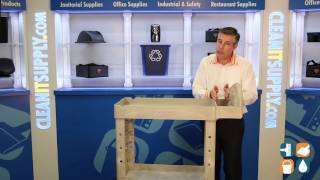 Structural foam construction, 500-lb. capacity. Two tray-style shelves, cup holder and storage slot to stay organized. 5" molded-in ergonomic full round handle for comfort. Non-marking casters (two swivel). Assembly required. 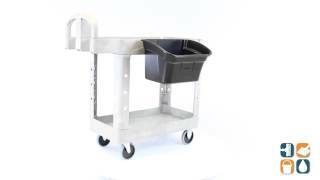 We ordered carts to house our cleaning materials for our school. The carts were exactly as advertised and service was excellent.